The subject today is the ‘Glasgow Girl’ artist Helen Lamb (1893-1981) whose work gave colour and meaning to church services for several generations of worshippers in the Church of Scotland. She studied at the Glasgow School of Art, and spent most of her working life in Dunblane, with a studio in Bryanstone, the house built by her father. Helen Lamb was known internationally for her calligraphy and manuscript illuminations, and her finest original work can be seen in Dunblane Cathedral, Dunblane Museum and in the Royal Collections. 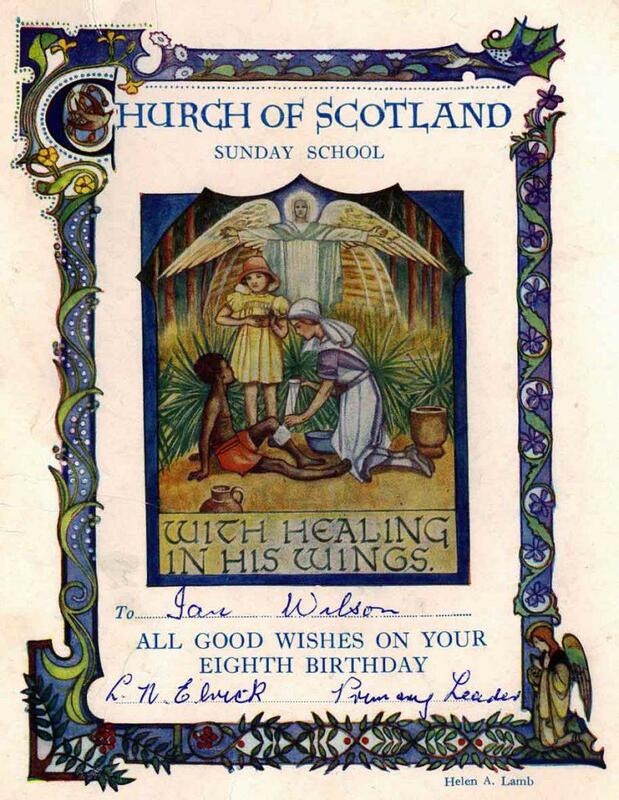 In 1927, the Church of Scotland obtained the right to print copies of her cradle roll, and these, together with her certificates, birthday cards for children, Girl’s Guildry, Women’s Guild cards and other works were used in Scottish churches world wide, to the end of the last century. Shown here is a Birthday Card for an 8 year old in Dunblane. Such works are now a rarity, so the new book on the Art of Helen Lamb by Dr. Valerie Inglis is timely. It explores her life and work in a full colour, sumptuous paperback of 142 pages, available at only £10 from the Stirling Smith and all good bookshops.